Entering 2009, I was eagerly anticipating My Morning Jacket's follow-up to Z, their 2005 guitar driven rock adventure featuring Jim James' reverb-treated vocals. That CD, appropriately entitled "My Evil Urges," gave into their not-so-good inclinations. Most bands want to grow artisticly, but they do so without abandoning their strengths. Alas. Fortunately, good ideas don't go unnoticed and evolve in the hands of others. The Beatles' Sgt Pepper was an evolution of The Beach Boys' Pet Sounds; Coldplay borrowed the cash cow of U2's signature sound for their own ends... and so it goes. MMJ's work also has its admirers. In October, 2007, Band of Horses released Cease to Begin, very much a successful idea grab from Z (though commiting a major rip-off by releasing a CD with only a smidgen more than 30 minutes of music). 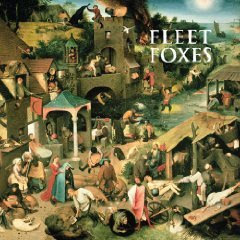 And finally, we arrive at Fleet Foxes' self-titled release. Whereas My Morning Jacket took their strengths and traded them for uninspired posturings, Fleet Foxes took the vocal reverb idea and pushed it to a new end. I can't say that this CD struck me with anything like "awe," or even a "wow," the first listen. Like Radiohead's Kid A or The Flaming Lips' Soft Bulletin, it took repeated listens to figure out what exactly this is. And if I liked it. Listening to their concert on the NPR podcast helped get a better feel for their music, but for some months afterward, I wasn't sure I really needed this CD. If there's one thing I've learned from other CDs that continue to creep into mind periodically, I need to quit arguing with myself and just go get the blasted thing. So I did. And I'm quite happy with it. I've read other reviews of this CD, and none of them quite sums this up, though certainly you might get a better take on it elsewhere. First and foremost, there's an emphasis here on harmonies. This isn't to say that Lennon-McCartney dropped them a top-20 tune with a ready-for-radio hook. Fleet Foxes has a different sound and different song structure. Perhaps if rock and gospel were mixed during the Reconstructionist South... Well, no. This band hails from Seattle, WA. Haunting remains the best description of this this CD. It's not littered with poltergeists or other mentions of the netherworld. It's more a feeling that comes from the whole of the work. Back to those harmonies. The vocal stylings are the main emphasis. They go places other bands have not seen fit to go, and if they've been traveled before, it seems likely that it was long ago. Add the echoing reverb of the vocals and maybe, just maybe, it brings chills to the skin. The lyrics themselves are poetic. They're not specifically negative, nor are they positive. The lyrics are not perfectly clear, but they tend to include a sadness on the observations made. This is not to say that the music is in any way depressing. Juxtaposed with the enthusiasm of the vocals and instrumentation, there's plenty of foot tapping opportunities. In short, this CD stands apart from anything else on my CD rack. Or in the I-pod. It's certainly not for everyone, but if you prefer artists who detour commercial expectations to chart their own path, this might be for you. Youtube videos are included below. Recommended songs: "Quiet Houses," "He Doesn't Know Why," "Ragged Wood," "Blue Ridge Mountains," "Your Protector"